Hello, Stampin' Friends! Welcome back to the Hampton Art blog! Make dark blue card base for a 4.25” x 5.5” card. Die or hand cut 4" x 5.25" kraft panel and adhere to card. Cut a 1" x 4.25" strip of patterned paper and adhere to card. Hand punch a notch on each side of the card (about .25" from bottom of patterned strip). Open card and wrap cord around front to inside of card (the notches will keep the cord positioned correctly) and tie a knot; close your card. Cut a 6" piece of cord and fold it in half. At the fold, slide the cord downward under the cord that encircles the card front; this will form a loop. Bring the cord's ends over the encircling cord and through the loop. (I've been told this is called a shepherd's knot.) Trim the ends accordingly. Stamp sentiment with dark blue ink. Stamp love and heart circles with embossing ink, sprinkle with embossing powder and heat set. 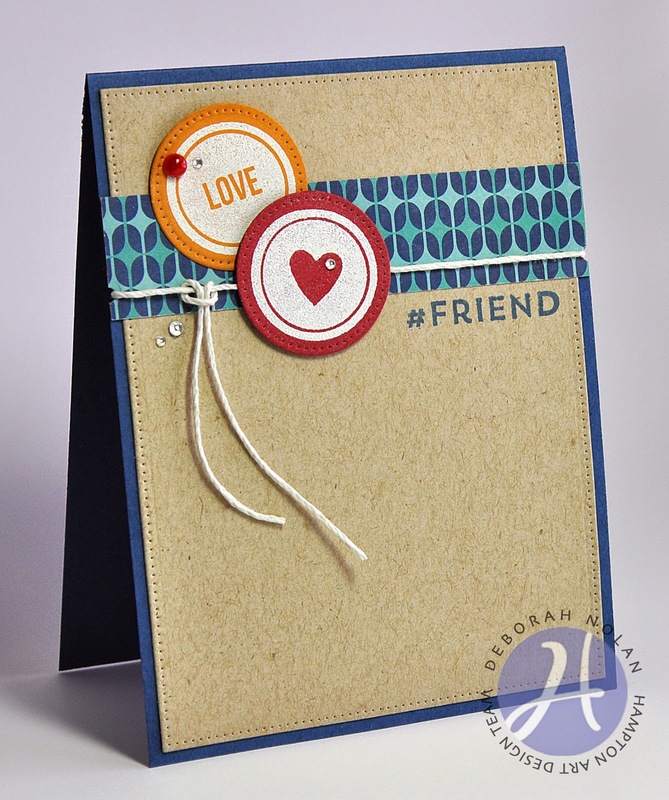 Hand or die cut stamped circles and adhere (use foam dimensional tape on the heart circle).